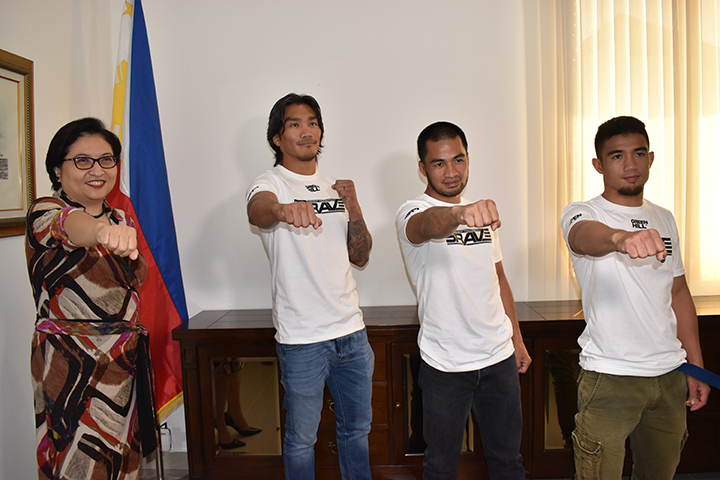 Three athletes from the Philippines competing in Bahrain-based mixed martial arts promotion Brave Combat Federation were recently welcomed to the Embassy of the Philippines in the United Arab Emirates. They are Vaughn “The Spawn” Donayre, 38, Crisanto “The Slugger” Pitpitunge, 31, and Jon Chris “Happy Feet” Corton, 26. Hailing from Benguet, both Pitpitunge and Corton are training at Team Lakay. Donayre is from Cebu and is a former ONE Championship athlete. Pitpitunge, Corton and Donayre are scheduled to compete at “Brave 16” on September 21, 2018. Together with their coaches, the three Filipino MMA fighters met Her Excellency Hjayceelyn Quintana, the Ambassador of the Philippines to the UAE. Featuring 11 bouts of fighters from 16 countries, “Brave 16” will take place at the Mubadala Arena in Abu Dhabi, UAE. Pitpitunge will compete in his second Brave CF bout while Corton and Donayre are making their respective promotional debuts. In the first bout of the evening, Corton will fight in the flyweight division against Hussein “Iron” Ayyad, 24, of Bahrain. In the third bout, Donayre will compete against Flavio Serafin of Brazil in a catchweight bout. In the fourth bout, Pitpitunge and Hamza Kooheji, 25, of Bahrain will battle it out in the bantamweight division. The Team Lakay fighter is looking to bounce back from his unsuccessful Brave CF debut. “Brave 16” will be headlined by reigning Brave CF Welterweight Champion, Carlston “Mocambique” Harris, 30, Guyana and his challenger is Jarrah “The Jordanian Lion” Al-Selawe, 26, of Jordan. In the co-main event, Bubba Jenkins, 30, of the United States will challenge reigning Brave CF Featherweight Champion Elias “Smile” Boudegzdame, 24, of Algeria.